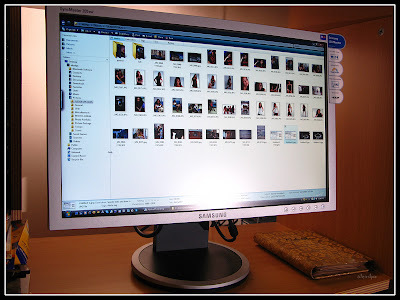 Until November of this year, I thought that a 17” monitor with a resolution of 1024 x 768 pixels is already very good. That 19” monitors are just plain excessive. But in November of this year, I was relieved from my site works and have been returned to our design office. Our office has undergone some renovations since the last time I was there and so my old work station is gone and so is my old computer. Nevertheless, our administration has provided me with a new cube (it’s considerably more spacious than my old cubicle so I’m calling it that) and then our IT department made arrangements for a computer that I can use. Part of the renovation works (and effectively re-branding) included upgrading our computers so I got one of the new computers with 19” Samsung SyncMaster 920NW LCD monitors. For some reason, I got one of the wide screen 16:10 aspect ration instead of the usual 4:3. (Majority of the new monitors delivered to our office were 4:3’s.) I’ve always preferred the wide screen monitors. I’ll explain this later on in this article. Anyway, I was glad to find out that it’s resolution is also much higher than what I got used to (1024 x 768 pixels). Sure my laptop’s monitor resolution is 1280 x 800 but with a screen size of 12.1” it looks basically the same as the old CRT. I did not fully appreciated the extra pixels. I mean, the old one was good so this one looked good to me too. Good but not better. Not a major leap forward. But my new office monitor – wow! That was the first word that came out of my mouth when I first turned it on. At 19”, 16:10 aspect ratio, a whooping 1440 x 900 resolution, and an effective viewing angle of 160 degrees, I thought it looked pretty amazing. I tried it with the usual software we use in the office – AutoCAD, and again – WOW! Even with all those icons in there I still have plenty of space to work on my drawings. And the 16:10 ratio was most effective because it makes working with multiple viewports really very convenient. I also found myself zooming in and out a lot less. Then I tried it with Excel and again it was so fantastic to be able to view more rows at a convenient size. And because it’s wide screen, more columns too. And then, it occurred to me – how will my pictures look on this? Electronically, I’ve seen my pictures large with multi-media projectors. They looked nice but I’ve always thought that the rendition of colors were a little different from what I see on my old CRT (or laptop). So the next day, I brought some of my photos – unprocessed jpg’s – from my Philippines and Brunei vacation last October and viewed it on my office monitor. I was dumbfounded by the clarity of the details the monitor has revealed. I spent my entire lunch break looking at hundreds of pictures testing especially those photos that looked good in my laptop and also those that looked bad. Those that looked bad turned out to be not so bad at all and the good ones looked even better. It’s probably important to note at this point that it does not do a good job of making any picture look good. What it does really well is reveal the fine details. Because as good as it is in showing the clarity of your pictures, it’s also very good at revealing noise and compression artifacts that I don’t normally see on monitors with lower resolution. Suddenly, my laptop’s monitor looked terrible. I love my new office monitor! I loved it so much that I decided to get one for myself at home – with my laptop, of course, as my CPU. Their prices have considerably gone down and have vastly improved since they were first introduced into the market. Looking around what’s available in the market the following day, I found out that there are even better ones out there. There’s a 20” and a 22” versions at a much higher resolution of 1680 x 1050 pixels. The 20”, while not that much bigger than my office monitor I figured that they would look better because of the much higher resolution. The difference in quality would probably be more obvious with 22” and perhaps that resolution is more suited to it but for its price, I could buy two 19” models. I think the 20” offered more bang for the buck so I went for it. At this point all these were just speculations because I couldn’t test it in the shop with my own stuff. Sure they look good but they were running sample photos and videos that were, of course, made for demonstration, designed to make the product look really, really good. For size comparison, here it is next to my laptop (to which it is connected to) with a 12" screen and a resolution of 1280 x 800. Upon arriving home I wasted no time in connecting my laptop and making the necessary adjustments to the desktop display, the difference in resolution became instantly apparent. I made my laptop wallpaper to fit exactly to its set resolution of 1280 x 900 pixels and so when it was displayed in my new monitor, the empty spaces around it is big enough to contain 3 columns each of icons at the right and left side of the screen without overlapping with the wallpaper picture. Texts were just the right size and very comfortable to read. The pictures? In one word, brilliant! The best photos looked even better but the not so good ones revealed their weaknesses. I saw some compression artifacts in some of the JPGs straight of the camera with medium quality setting. Now I’ve set my camera to shoot RAW + best quality JPGs. Watching slideshows in this monitor is such a joy. And I’m very happy about it. HDTV’s are at least 720p and Full HD’s are 1080p. At 1680 x 1050 pixels, this monitor is nearly Full HD and it’s actually equipped with an HDCP port and supplied with the respective cable. I’m sure that Blu-Ray movies would also look really good here. Sadly my laptop is not that equipped and I only have regular DVD’s. My best quality movie (“King Kong”) did not looked so good. Colors looked dull and the images soft. Adjusting to a lower resolution to match that of the DVD did not help and actually made it worse. I guess, that’s any LCD’s “weakness” – they look good at their native resolutions (resolution for which they were designed for) but look terrible when adjusted to a different one. 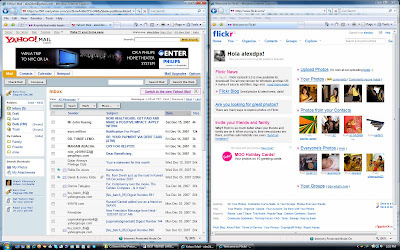 Wide screen format allows working on applications side by side. At a resolution this high, it's even more wonderful. 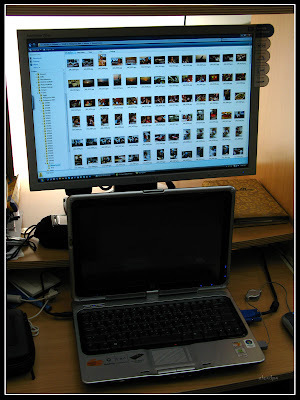 The high resolution and 16:10 wide format allows me to browse two windows side by side without overlapping on top of each other and without having to pan left and right on either window. Well – flickr, Yahoo! Mail, and most blogs at least. As mentioned above, working with Spreadsheets and AutoCAD is very nice on the 19”. It’s even better here. I just wasn’t able to test AutoCAD because Autodesk has not yet made a version that is complatible with Windows Vista (my laptop’s operating system). - Design – despite the screen size, it’s a space-saver. It has a thin bezel which helps in minimizing the overall dimensions while maximizing screen size. It’s also provided with a stand that allows you to swivel the monitor up and down or left and right – and the height is adjustable. The stand has a circular footprint of just 19.5 centimeters. - HDCP port – Hopefully I could afford to buy a computer with Blu-Ray drive and HDCP connection in the future. That makes it future-proof enough for me. - Comprehensive adjustment buttons. Other than the usual brightness and contrast controls, it’s also equipped with Samsung’s proprietary MagicBright button which allows you to choose preset settings for text, internet, games, sports, movies or your own custom settings. The menu controls even allows you to adjust sharpness, fineness and coarseness of the display. If all of those sounds complicated, you can just press the “Auto” button. - Nothing major really. It’s just that my slightly smaller, slightly lower resolution and slightly cheaper office monitor has a wider viewing angle of 178 degrees while mine is “only” 160 degrees. That’s not so bad, is it? 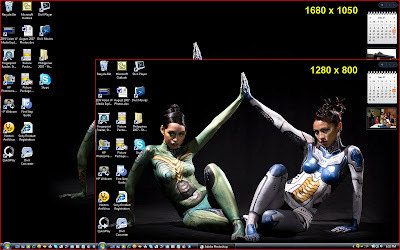 Here's the difference between a 1280 x 800 and 1680 x 1050 resolution monitor. Note that the sizes of the icons are identical yet the difference in physical size is very compelling. For its price (around PHP 11,650) I think it’s a really good monitor. I have yet to find a major fault to not recommend it to anyone looking for a big monitor. Watching normal video (full screen) is probably the only disadvantage here so YouTube addicts, be warned. Incidentally, my wife told me that when she tried to use this monitor, she felt a little dizzy. Apparently it felt like watching a movie from the front row seat inside a cinema. Perfect for me – it’s just the way I like to watch movies. Wide screen / high res combination is great for virtually any application. It may be excessive for simple word processing but in this case, I’d say too much of a good thing is a good thing.